Formerly AAHE, it is the oldest association in the United States dedicated to the advancement of higher education. Network of higher education professionals founded in 2010 to advance assessment. Organization dedicated to the profession of institutional research. AIR also publishes assessment materials and has an assessment track at their annual forum. AACU is the leading national association concerned with the quality, vitality, and public standing of undergraduate liberal education. Their website contains an entire section on assessment. CHEA is the largest higher education membership organization the United States. CHEA is the primary national voice for voluntary accreditation and quality assurance to the U.S. Congress and U.S. Department of Education. Each year the Council for Higher Education Accreditation (CHEA) awards colleges and universities that have made Institutional Progress in Student Learning Outcomes. Education Sector is an independent think tank whose mission is to promote changes in policy and practice that lead to improved student opportunities and outcomes. The nation's largest foundation dedicated exclusively to increasing students' access to and success in postsecondary education. Founded in 2008, NILOA assists institutions and others in discovering and adopting promising practices in the assessment of college student learning outcomes. A coalition of associations, organizations, and individuals formed in 2009 to promote collective efforts to gather, report on, and use evidence of student learning in American undergraduate education. Collegiate Assessment of Academic Proficiency (CAAP) – a standardized testing program used by colleges and universities throughout the nation. It is often used to help assess general education competencies. Graduate Record Examination (GRE) – a standardized test measuring verbal reasoning, quantitative reasoning, and critical thinking and analytical writing skills. GRE subject tests in Biochemistry, Cell and Molecular Biology, Biology, Chemistry, Computer Science, Literature in English, Mathematics, Physics, Psychology are designed to measure undergraduate achievement in these subject areas. ETS Major Field Tests – comprehensive undergraduate and MBA outcomes assessments offered by the Educational Testing Service designed to measure the critical knowledge and understanding obtained by students in a major field of study. Students in undergraduate and MBA programs may take the Major Field Tests. The Major Field Tests cover the following fields of study: Biology, Chemistry, Computer Science, Criminal Justice, Economics, History, Literature in English, Mathematics, Music, Physics, Political Science, Psychology, and Sociology. ETS Proficiency Profile – formerly the Measure of Academic Proficiency and Progress (MAPP), the Proficiency Profile is a comprehensive test most often used to gauge general education competencies. Bloom's Taxonomy - List of action verbs at each level of Bloom's taxonomy. It can be used to assist faculty in developing student learning objectives. Checklist for Evaluating Written Objectives - A useful tool for use in evaluating the effectiveness of learning objectives. Connecting Outcomes to Curriculum - A useful template from the Middle States Commission on Higher Education to assist is identifying learning objectives in a curriculum. Curriculum Mapping - A curriculum map from a Psychology Department that uses the IDM approach to mapping learning objectives. Direct and Indirect Evidence - Examples of direct and indirect assessment techniques from Linda Suskie of the Middle States Commission on Higher Education. Learning Goals and Assessment Techniques Template - Derived from a template from the Middle States Commission on Higher Education, this tool will help faculty visualize how to assess student learning objectives. Principles of Good Practice for Assessing Student Learning - From the American Association for Higher Education, these are the nine principles of good practices for assessing student learning. Rubrics to Assess Student Learning Objectives - Eight point rubric to assess the quality of written learning objectives. Rubric for Evaluating Institutional Student Learning Assessment Processes - A tool for institutions to assess the status of their current assessment efforts in terms of Middle States' accreditation standards and expectations. Rubrics help instructors evaluate student work consistently and objectively. Rubrics make your evaluation criteria transparent. Rubrics help instructors provide detailed feedback to students. Rubics help to make scoring faster and easier. At Lehman, we are committed to providing students with an education that will prepare them to be successful in their professional lives. Strong written communication skills are essential, regardless of the path that our graduates take after they leave Lehman. Please click on the following links for additional information about assessing students' written comminication skills. What is learning outcomes assessment? “Assessment involves the use of empirical data on student learning to refine programs and improve student learning.” (Allen, 2004). Why is Middle States so concerned about assessment? Voluntary, accreditation via peer review is the primary mechanism used to ensure quality in higher education in the United States. Middle States, through adherence to high standards for student learning outcomes and operational behavior, seeks to assure higher education’s publics that its accredited institutions are fulfilling their stated purposes and addressing the publics’ expectations. In recent years, calls by the public for accountability and transparency in higher education have increased due to continued cost escalation and a perception by many that college graduates are poorly prepared to enter the workforce. Middle States and the other regional accredited bodies have argued that accreditation via peer review is preferable to the top-down approach recently discussed by the federal government as evidenced in the No Child Left Behind legislation at the K-12 levels. I give students a grade in my course, am I not already doing assessment? Grades alone are not sufficient evidence of student learning because by themselves, grades do not give enough information about the learning that was tested or the criteria that were used. Among the multiple problems that attend the grading system are: grade inflation, lack of consistent standards and vague criteria among courses and institutions, non-learning criteria used in the grading process, student motivation that focuses too narrowly on grades, etc. For more a detailed explanation of grading, click on the following article from Carnegie Mellon University - Grading vs. Assessment of Learning Outcomes: What’s the difference? Does learning outcomes assessment infringe on the academic freedom of faculty? What is the difference between direct and indirect evidence? Direct evidence is clear, tangible evidence that students have or have not learned. Examples include scores on licensure/certification exams, capstone experiences using a rubric, portfolios, etc. Indirect evidence, on the other hand, provides signs that students are likely learning, but the proof that they are learning is not as clear or convincing. Examples include: course grades, survey results, test scores unaccompanied by a rubric, student evaluations, etc. Who is responsible for conducting program level assessment? Program level assessment is the responsibility of the faculty in the majors or programs being assessed. The assessment coordinator and the Assessment Council will provide their support and lend their expertise when needed. Will assessment results be used to evaluate faculty? No. Assessment of student learning is not an evaluation of faculty performance. The College has a separate process for this. Assessment is done by faculty in an academic department or program. In interpreting the results of an assessment measure, faculty might collectively decide to give more attention to certain outcomes, and might even recommend changes in pedagogy. Is there a difference between assessment and evaluation? Yes. Evaluation is the analysis and use of data by faculty to make judgments about student performance. Evaluation includes the determination of a grade or a decision regarding pass/fail for an individual assignment or a course. Assessment, on the other hand, is the analysis and use of data by students, faculty, and/or departments to make decisions about improvements in teaching and learning. How does testing fit into an assessment plan? Testing clearly has an important role in assessing student performance, but it is not the only assessment tool. For additional information on testing, click on the following link from Ball State University and reference Chapter 7. What is the difference between student learning goals, objectives and outcomes? Student learning goals are broad statement of desired outcomes - what we hope students will know and be able to do as a result of completing the program/course. Objectives are clear, brief statements used to describe specific measurable actions or tasks that learners will be able to perform at the conclusion of instructional activities. Learning outcomes are learning results - the end results -- the knowledge, skills, attitudes and habits of mind that students have or have not taken with them as a result of the students’ experience in the course(s) or program. Why is it important for a syllabus to include course objectives? Shouldn't this already be understood by students? Having clear learning objectives on syllabi help both students and instructors. For students, learning objective helps them know exactly what the expectations are upfront so they know what to do and how they will be evaluated. From the instructor’s viewpoint, it helps him/her focus assignments to meet the objectives of the course. They also aid in evaluating student work. Where can I find more information on campus about assessment of student learning? Additional information on assessment at Lehman College can be obtained by contacting Raymond Galinski, Assessment Coordinator, by e-mail at raymond.galinski@lehman.cuny.edu or by phone at 718-960-8645. Where can I find examples of student learning outcomes in my discipline? Examples of student learning outcomes can be found by searching the Internet for assessment resources in your discipline. Additional sources of learning outcomes may be found by consulting the professional societies and accrediting agencies listed on this website. What is a curriculum map? A curriculum map describes where learning opportunities throughout the program will occur. Examples may be found in the Assessment Toolkit portion of this web site. Taskstream's (a/k/a Watermark) Accountability Management System (AMS) is a cloud-based system used for academic and administrative assessment planning and reporting. Taskstream allows departments to more efficiently monitor learning outcomes and program goals, and demonstrate how assessment data is used for continuous improvement. 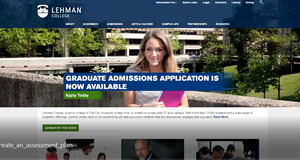 At Lehman, the system has been customized to meet College's annual assessment reporting cycle. Access to Taskstream's AMS is available to all faculty and staff, but use of the system will likely depend on each person's involvement in assessment related activities in a department. For academic programs, all faculty assessment coordinators and chairs are expected to use Taskstream regularly to make submissions, upload documents, and to monitor assessment reporting requirements. The Office of Assessment and the Dean's Offices will use the system to ensure that submissions are timely and meet the College's expectations. For Administrative departments, directors and/or assessment coordinators will interact with the system to submit annual assessment plans and reports. How do I sign into Taskstream? Go to https://www.watermarkinsights.com/. Click Login/Sign Up. Select the Taskstream tile. Enter your email address and password. How do I obtain an account? To obtain a Taskstream account for the first time, please email Raymond Galinski and Donald Sutherland. Please indicate the department or program you would like access to. If you previously had access and do not remember your password, please click on the Forgot Login? link on the Taskstream home page and complete the necessary information. A temporary password will be emailed to you. Please note that the password is not the same as your Lehman College email account. What information should be reports in Taskstream? Where do I obtain information on how to use Taskstream? Additional information on the use of Taskstream's ASM can be obtained from several places.